Voices of the Marginalised: Participatory research with persons with older people and people with disabilities in Tanzania. Hear my Voice: old age and disability are not a curse: This is a community-based participatory research (CBPR), which involves respectful collaboration with the community. The overall objective of this study is to provide evidence on the specific nature and experiences of older people and people with disability from their own perspectives in rural (Nachingwea) and urban settings (Kibaha district). 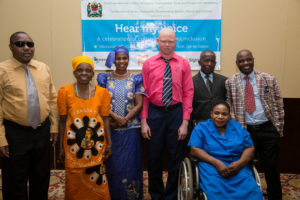 Specifically, the VOICE study was designed firstly to understand the experiences of social, political and economic inclusion and exclusion of persons with disabilities and older people in Tanzania from their own perspectives. A secondary objective was to generate comprehensive knowledge that will guide global policy-making and the implementation of development programmes emerging from the Sustainable Development Goals. Thirdly, it seeks to understand how people with disabilities and older people understand inclusion and exclusion within the contexts of their families, communities and broader society. The study highlights that while persons with disabilities and older people make an invaluable contribution to society, they can be particularly vulnerable when it comes to healthcare, livelihood and access to services.